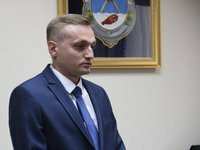 The case over the suspected suicide of Vladyslav Voloshyn, acting director of Mykolaiv International Airport and a former military pilot and veteran of the Anti-Terrorist Operation (ATO) in Donbas, has been sent for full investigation to the National Police branch in Mykolaiv region. A criminal inquiry has been launched on the charge of "premeditated murder," the inquiries will focus on all possible theories and causes which may have led to the tragedy, a spokesperson for the branch wrote on Facebook on Monday. To ensure a full and unbiased investigation, the case has been entrusted to police investigators in the Mykolaiv region, inquiries are under way, the post said. "The National Police's main directorate in the Mykolaiv region expresses its sincere condolences to the family of Vladyslav Voloshyn, acting general director of Mykolaiv International Airport, and notes that the branch's chief, third-rank Police General Yuriy Moroz has taken charge of the investigation," the police said. Meanwhile, Oleksiy Savchenko, head of Mykolaiv Regional Administration, has expressed his indignation at the rumors sparked by Voloshyn's death, and said he was waiting to hear an official position from the relevant authorities. "Many of those who did not even know Vlad and his work at the enterprise [Mykolaiv airport] have begun spreading all kinds of nonsense about some millions worth of tenders and so on. Some started circulating Vlad's correspondence with, as far as I understand, former managers of Mykolaiv International Airport, who were the ones who messed up," Savchenko wrote on his Facebook page on Monday. He warned everyone against getting involved in something they did not understand. "There are law enforcement authorities who will investigate what happened objectively and fairly. I am awaiting the official position of the competent authorities and for everyone involved in the incident, all nuances notwithstanding, to be held to account," Savchenko said. It was reported that Voloshyn died on March 18. He was rushed to a hospital where he died from sustained injuries. "According to his relatives, the man had recently felt depressed and expressed alarming intentions," the police said.